Here in this article we will see how we can manage & monitor JBossAS 7.1.2 using JBoss Native Management APIs, this approach is best for the java developers, as in many production environments it is very convenient to manage the application respources based on java code. The developers wants to mmanage things using java style of programming, So for those develpers JBoss Native Management APIs is much convenient way of managing the JBoss. static boolean standaloneMode=true;     //  If you are running your Servers in Domain Mode then set this to false. NOTE: The only change in the above file you need to do is to change the “jboss.home” directory path in the second line of the above script to point to your own JBoss AS7 directory. It requires 5 Jars to be present in the Client’s classpath as mentioned in the above xml file. Non XA DataSource "ExampleDS" is RUNNING Successfully. For this article we would be using JBoss AS 7.1.2 and the same concept would be used, which is setting up the expiry period for a messages (i.e. 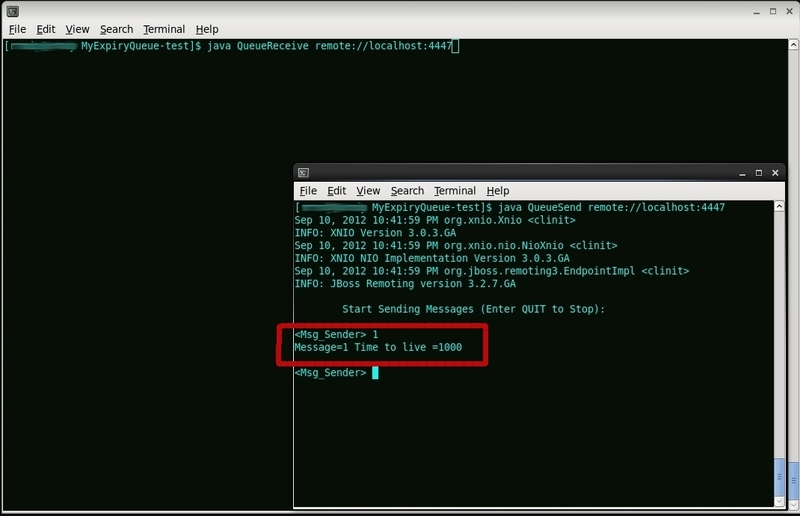 when setTimeToLive is been used in the code) and as per JMS specification which states that clients should not receive messages that have been expired which does not grantee that. Hence once the messages gets expiries they are been moved to the expiry queue which has been assigned to the given queue. Now these “expired” messages can later be consumed from the expiry destination for further inspection. 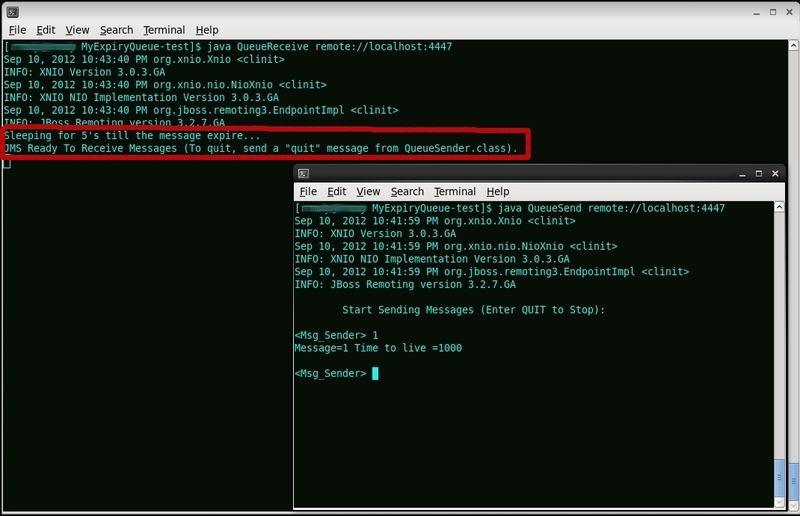 In this example we will send 1 message with a short time-to-live to a queue. We will wait for the message to expire and checks that the message is no longer in the queue it was sent to. Make sure that the JBoss AS 7.1.2 is running, in our case we started JBoss AS 7.1.2 standalone-full.xml profile. That’s it !!! You are done configuring a simple queue with a custom ExpiryQueue. 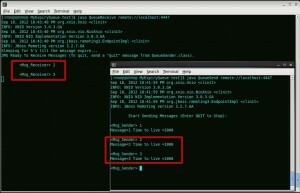 Let’s test this out using the sender and receiver Java code. Create a Directory somewhere in your file system like: “/urs/JBossAS7.1.2/HQ/Queue/MyExpiryQueue-test” to write the QueueSend.java and QueueReceive.java programs. In QueueSend.java copy the below program, where we are setting the first messages to live for 1s (1000ms) before expiration. In QueueReceive.java copy the below program, if you notice that before we are creating the Receiver we are making sure that the program starts 5 seconds late so that the first message sent gets expired as its time to live is 1 second. So the first messages is never consumed and that messages is been moved to expiry queue. But other messages would get consumed as the consumer is up and listening to the MyQueue. Now open 2– command prompt and run the “. ./setJBossEnv.sh” by adding two DOTs separated by a single space, in both the prompts to set the Environment (PATH & CLASSPATH). 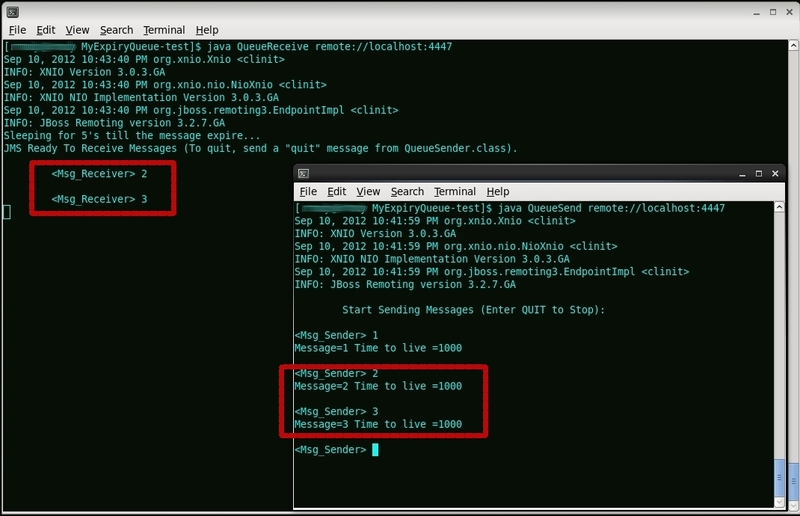 Then compile the QueueSend.java and QueueReceive.java programs. In this demonstration we will see how to configure Native Management Interface to use the SSL, As it is desired in many production/secure environment to access the JBoss via CLI utility over SSL sothat the communication will be in SSL encrypted format. So in this example we will see how to configure the JBoss AS7.1.2 sothat we can connect to it via SSL port 9443 (management-https socket binding). [userone@localhost configuration] keytool -genkey -keystore chap8.keystore -storepass rmi+ssl -keypass rmi+ssl -keyalg RSA -alias chapter8 -validity 3650 -dname "cn=chapter8 example,ou=admin book,dc=jboss,dc=org"
Step2). Make sure that the JBoss AS7.1.2 is running, In our case we started JBossAS7.1.2 “standalone-full.xml” profile. -Djavax.net.debug=all This System property will give us more details about the SSL Communication so we enabled it just to varify if the SSL configuration is working properly or not.